Versatile Vinegar: Cleaning the Greener, Cheaper Way! So, now that I've given you an overview of the facts about vinegar and its various types and uses, let's talk about cleaning. White vinegar, also known as distilled vinegar, is a great inexpensive way to clean your home, as it naturally cleans like your typical all-purpose cleaner. It is also a greener alternative to chemically-based products because it's better for the environment. You may begin by buying an inexpensive spray bottle (24-36 oz.) and mix a solution of 1 part vinegar and 1 part water. You can use this solution to clean all most all areas of your home. 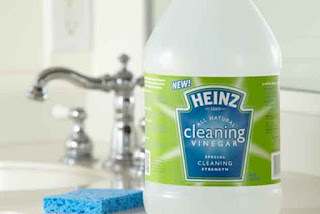 Vinegar is not only a great all-purpose cleaner, but a deodorizer and disinfectant, as well. Please note: vinegar that isn't properly diluted can eat away tile grout (remember, it is acidic!) and should never be used on marble surfaces.